Luxury hotels and upscale resorts, favored properties for lodging REITs, have been in high demand by a variety of travelers for several years. Yet, few new hotels are under development, which is anticipated to push occupancy rates to 30-year highs by 2016. Meanwhile, increases in international travelers visiting the United States and rebounds in business and group travel have energized the sector. Jon Bortz, CEO of Pebblebrook Hotels (NYSE: PEB), expects occupancy rates to reach 65.5 percent in 2016, a record level for the industry. He points to the growth in overseas travelers coming to the U.S. as a key factor in the clamor for hotel rooms. Spending the night in the post office, a bank, a warehouse or a train station may sound unpleasant. Hotel REITs, however, are turning some of these properties into unique luxury hotels. “Hotels that served another function in the past offer unique ways to provide a special experience to guests and a way to provide a new development without ground-up construction,” Hersha’s Shah explains. 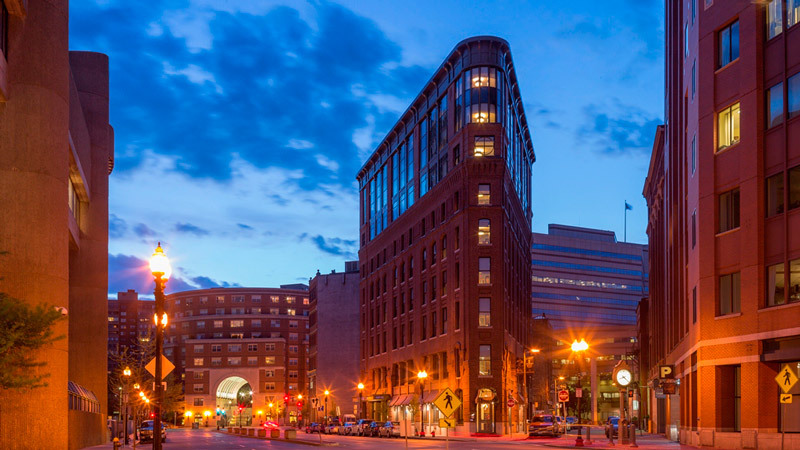 Hersha Hospitality Trust’s repurposed hotels include The Boxer in Boston, which used to be an office building, and The San Diego Marriott Downtown, a former bank building. Bortz does note that reconfiguring the buildings as hotels can be expensive. On the other hand, he says, there’s value in owning a unique asset. “You can build a box for a hotel and make it nice, but these places are on the National Historic Register,” he says. According to the U.S. Department of Commerce, the number of international travelers to the U.S. rose from 68 million in 2012 to an estimated 74 million in 2014 due in part to the impact of the rise of the U.S. dollar. W. Edward Walter, president and CEO of Host Hotels & Resorts (NYSE: HST), says the growth of international travel into the U.S. in the past three or four years makes this business cycle different from the past. “International travelers equal 20 to 25 percent of room nights now, particularly in gateway cities and major resort destinations such as Orlando,” Walter says. In addition to international visitors, David Loeb, a senior analyst with Robert W. Baird and Co., says corporate travel for individuals returned as the economy improved. Now, he observes, group travel is also once again positively impacting hotels. According to Ryan Meliker, a senior REIT analyst for MLV & Co., corporate demand was up 4 percent in 2013 and in 2014. He notes that it is forecast to rise 3.4 percent in 2015. Group travel demand was flat in 2013, but up 4 percent in 2014, and he estimates it will be up 4 percent in 2015. “With rising occupancy comes rising rates,” Meliker says. Meliker says the average price per room in full-service hotels increased 8 percent in 2014 compared to 2013. He points out that the increase could be higher for REITs because they generally specialize in higher-end hotels. “Good demand and soft supply provides better revenue growth, so industry-wide we’ve seen REVPAR [revenue per available room] around the 7 to 8 percent range, which means profits are running in the 10 to 15 percent range,” Walter says. Rising demand for hotel rooms has yet to lead to significant new construction, in part because of a lack of financing, according to observers. Instead, REITs are looking for redevelopment opportunities. One new variable in the hotel sector equation is Airbnb, which allows individuals to become hoteliers by renting out their homes. So far, hotel industry observers contend that Airbnb has had a limited impact on hospitality REITs. According to Meliker, the majority of demand for REIT-owned hotels comes from corporate travelers who prioritize safety and security. Shah says his view is that innovation drives hotel owners to do better. He and Walter agree that hotel companies will watch Airbnb to evaluate whether they need to make changes to address competition with the home-sharing model. There are also potential regulatory concerns. “The challenge with Airbnb is that they’re not operating under the same set of rules as hotels in terms of licensing, safety, handicap accessibility or taxes,” Walter notes. “We’re not doing any ground-up development in the U.S. at all right now, but we’re doing significant renovations on existing hotels to reposition them in the market and bring dramatic changes in operating results,” Walter says. Pebblebrook is following a similar strategy, according to Bortz: Redeveloping capital-starved properties and creating a better experience for guests in terms of amenities and service. So, how much longer will lodging REITs continue to enjoy the benefits of tight supply? Loeb says it should push occupancy rates up through 2016 and possibly into 2017. Walter shares those sentiments.